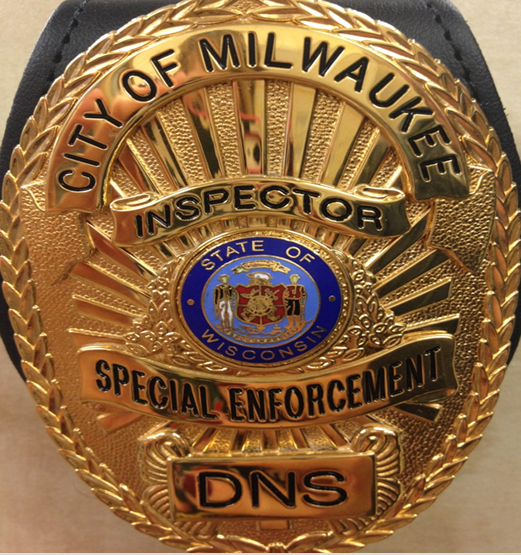 Special Enforcement is the division in The Department of Neighborhood Services which addresses residential and commercial property issues through the zoning, occupancy, fire, and maintenance sections of the Milwaukee Code of Ordinances (MCO). Through the enforcement of the code, Special Enforcement Inspectors address neighborhood issues, nuisance activities, and gain compliance of maintenance violations by using a multifaceted approach. Through a collaborative effort with our community partners, we protect tenants from landlord abuse. Additionally, we proactively assess neighborhoods through block surveys to address unreported issues which will prevent destabilization and safeguard the community. Many times our neighborhoods are negatively impacted by violations of the zoning code in residential districts. Special Enforcement Inspectors survey properties for these violations, educate property owners on the applicable code sections, and work with them to gain compliance. Auto repair (See MCO 295-503-3) – Repair businesses being operated in a residential neighborhood can detract from its continuity and character and therefore is prohibited without an approved variance from the Board of Zoning Appeals. In residential districts, property owners are limited to conducting minor auto repairs on their own vehicles when done in a garage with the door closed. No body work or painting is allowed. Outdoor storage - The storage of uncontained materials in yards can detract from the character of an area and have a negative impact on neighbors and is a violation of the zoning code. Residents may meet with an inspector to ascertain the amount of storage that is allowable. Fences - Fences in the City are required to have a permit and must meet specific criteria when being built. In general, front yard fences are limited to 4 feet, side yard fences are limited to 4 feet but may have an additional two feet added if that addition is at least 50% see through, and rear yard fences are limited to 6 feet. Please follow the link to see the complete fence code which addresses allowed fence materials, vision triangles, and setbacks. Property owners who wish to build a fence that is outside of the acceptable conditions may apply to the Board of Zoning Appeals for a dimensional variance. Home occupancies - Frequently residents wish to operate a small business out of their home. This activity is often in violation of the MCO. Some home businesses require an occupancy certificate while others require a registration. Contact the Permit & Development Center for complete information on home occupancies. Parking issues – Often times the parking of vehicles on a residential lot becomes a detraction from the character of the neighborhood. The zoning code addresses this by limiting the number of vehicles to a maximum of four licensed and operating vehicles to be parked in public view on a residential lot. Vehicles must be on an approved surface and not on the grass, dirt. Gravel parking areas at 1or 2 family dwellings, existing prior to 1978, are allowed to remain provided they are maintained free of ruts or weeds. Occupancy Topics - Do I need a BOZA? Occupancy Certificates – All operating businesses and occupied homes require an occupancy certificate prior to use. A permit can be applied for at the Permit & Development Center. Frequently, the proposed business or occupancy is not allowed in the zoning district where it is located. In these instances, the applicant will be informed when they apply and may appeal to the Board of Zoning Appeals to gain approval. At any time, applicants may contact their inspector or Permit Center staff for assistance. When a property has violations that have not been brought into compliance after extensive time, court proceedings, and follow-up by inspectors, they will be placed on monthly re-inspections. If you find yourself in this program, contact your Special Enforcement inspector to discuss a plan to gain compliance. You may submit a work plan detailing a timeline on when the violations will be abated. Also, a meeting to clarify may be scheduled free of charge. In addition, properties that are owner-occupied may qualify for assistance through the Compliance Loan Program. If you are a tenant who has violations on your rental unit or rental home you are afforded protections under the Code of Ordinances. If you discover a violation, inform the property owner of the violation. You must allow the owner a reasonable amount of time to make repairs. If repairs are not made, you may report the situation with Click for Action or by calling (414) 286-CITY and an inspection can be scheduled. If orders are issued but the repairs have not been made by the due date, you may be eligible for Rent Withholding or Rent Abatement. The Milwaukee Code of Ordinances provides tenant protection through the retaliation ordinance. Community Advocates and Legal Aid may provide additional resources. So you’ve been placarded, what happens now? When a property is found to have conditions that make it unsafe for habitation, it may be placarded and must remain vacant until the conditions have been improved. Each case is different, but some of the conditions that may require a placard are; lack of essential services (water, electric, heat), hoarding, structural failure, sewage in the basement or other unsanitary conditions, and/or electrical meter tampering. If your property or rental unit has been placarded please see the FAQ below or contact your Special Enforcement Inspector. Once your property is placarded you must obtain a new occupancy certificate. Repair permits and occupancy certificate should be applied for prior to starting repairs. You are allowed to enter your property in order to make repairs but it must otherwise remain unoccupied and secured. You are still responsible for the maintenance of the yard (mowing grass) and the sidewalk (snow removal). Owners may receive additional fees if not maintained. A placard is not an eviction of your tenants, they continue to have tenant rights. You must immediately vacate but may qualify for assistance through Community Advocates. Even though your unit has been placarded, you maintain your tenant rights and responsibilities. Take all of your valuables including all medications. Maintain contact with property owner. All pyrotechnic displays require a permit. Apply for permit online in LMS. For additional information please contact the Pyrotechnics Coordinator or Special Enforcement Manager. Special Enforcement Inspectors are available to present at meetings, block watch and landlord groups, and other educational opportunities. We are glad to share our experience and code knowledge with your group. Please contact the Outreach Section or Special Enforcement Manager to make arrangements for a speaker.